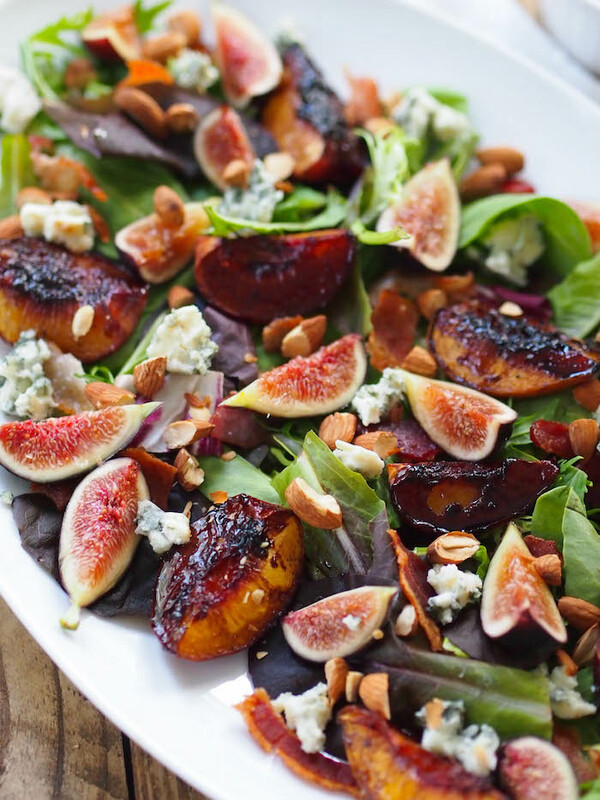 A recipe for balsamic roasted peach, fig and almond salad inspired by my trip to Lodi California with the Almond Board of California! Disclosure: My trip to California was sponsored by the Almond Board of California. I was not compensated to write this post and all thoughts and opinions are my own. I've been back from my trip to Lodi, California with California Almonds few days now and have had a chance to reflect on what an incredible experience it was. It was refreshing to see how a large organization in the food/agriculture industry has taken huge steps to promote green initiatives and nutrition research. Although the point of the trip was to learn about almonds, I also feel incredibly inspired after spending time with so many smart, talented and ambitious dietitians. Thank you to the lovely team at the Almond Board of California for planning such an incredible experience and inviting me to be a part of it! After a not so pleasant flight experience (the only part of the trip that wasn't absolutely fabulous! ), I finally made it out to Wine & Roses Hotel and Spa in Lodi, California. Although I hadn't heard of Lodi before the trip, it's a major wine growing area in California, and they actually grow the grapes for many Napa/Sonoma County wines. The hotel grounds were absolutely gorgeous as was my room, perfect for a romantic weekend getaway or, you know, dietitian blogger slumber party. My flights were delayed (yes, all of them), so I missed the culinary demonstration with almond-inspired recipes, but I made it out just in time for a beautiful and healthy dinner outside on the hotel pavilion. My dear friend Meme saved me a spot at the table with my Blog Brulee friends McKenzie of NourishRDs and Kylie of Imma Eat That as well as my former online friends/now real life friends Alex of Delicious Knowledge and Emily of Zen and Spice. I also got to meet Megan (aka Healthy Grocery Girl) and Abbey from Abbey's Kitchen, two dietitians whose work I've long admired. 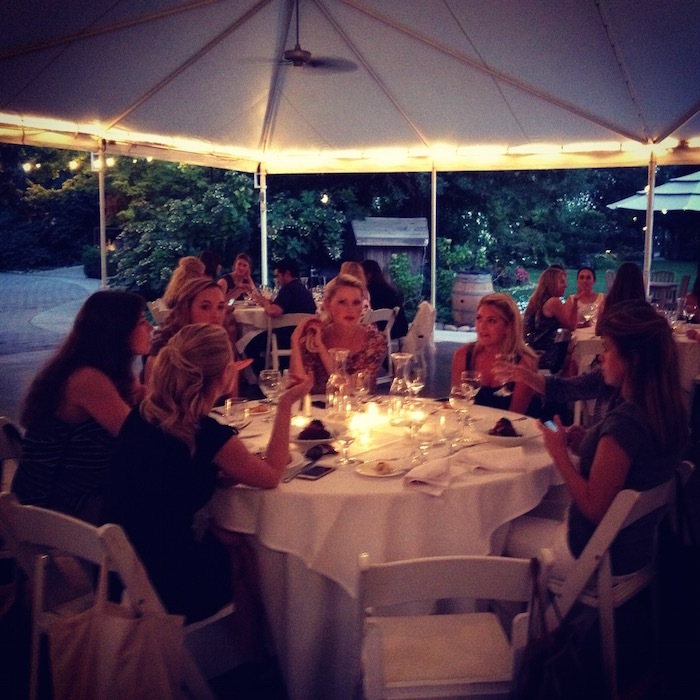 We spent the night chatting about nutrition, our careers, and dietetics as a profession. It felt so good to be around RDs with such similar philosophies! The next morning, I dragged myself out of bed for a yoga class led by Alex. Y'all, she is an incredible instructor and if I ever become a millionaire, I am going to hire her to be my personal yogi! A refreshing yoga class in the gorgeous hotel grounds was exactly what I needed to beat my jet lag. 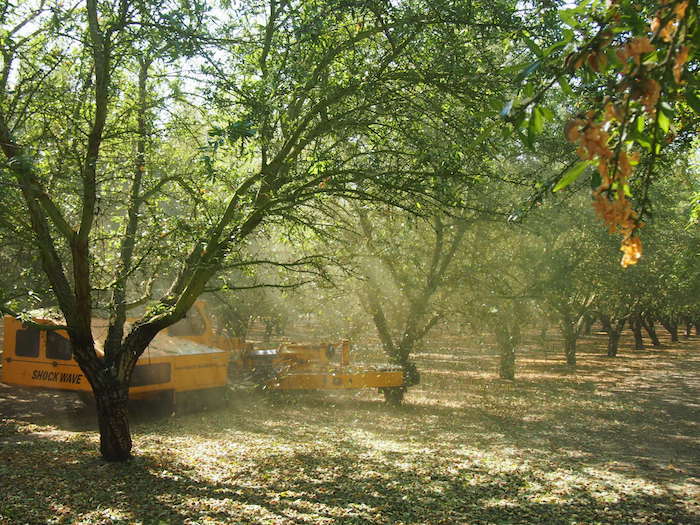 The Almond Board of California is a nonprofit, self-funded organization that represents almond growers in California. More than 90% are family farms and about 75% of the farms are under 100 acres. They use their money to fund research on almond nutrition and growing practices. Almonds grown in a Mediterranean climate and therefore can only grow in five areas of the world - the Mediterranean, Chile, the coast of South Africa, the Southwestern coast of Australia and of course, California, who grows about 83% of the worlds almonds. Almonds are California's #2 most profitable crop. For over 30 years, not just since the start of the drought, the Almond Board has been funding research to decrease water use when growing almonds. About 83% of growers use demand based irrigation, which tracks soil, tree and weather conditions to decide exactly how much water to use, and 70% use microirrigation, essentially spoon feeding water directly to the root. That's a big part of the reason why it takes 33% water to grow almonds today as it did 10 years ago. Learn more about sustainability on their site. At the risk of stating the obvious, almonds grow on trees and trees are good for the environment, particularly for their ability to harness carbon and keep the air clean. The Almond Board was pleasantly surprised after a lifestyle study showed the almond industry is pretty darn close to being carbon neutral and are actively taking steps towards being carbon negative. Almonds and bees are best buds. Almonds are bees first natural source of food each spring and without bees to pollinate, almonds simply wouldn't exist. I'm sure many of you have heard of the devastating colony collapses affecting honey bee populations, which is why California Almond Board has funded more research on bee health than any other crop or commodity board. Learn more about bees and almonds cozy relationship on their site. We had a nice long break before dinner so Lisa of Healthy Nibbles and Bits, Alex, Meme and I went wine tasting. When in California! Many of my highlights from the trip were with these three - such fun ladies! For dinner, we visited Lange Twins Winery where we were treated to a tour of their vineyard and dinner in their gorgeous wine cellar. The table was set up so beautifully, we kept remarking that we felt like we were at a pinterest wedding! Bonding with McKenzie, one of the highlights of my trip! The next morning, I woke up bright at early to go for a run with Deanna, Kim of KH Nutrition, Heather of Spright, and Kylie. They're all legit runners, so I was a little scared that I would be left in the dust, but we just went for a 30 minute run and had plenty of breaks for pictures of the gorgeous sunset on Lake Lodi! Tasting all the different wine grapes with Alex. Obviously, we're selfie gals. After breakfast at the hotel, we went to Travaille and Phippen, an almond orchard and processing facility where we got to see everything we learned the day before in action. For me, the highlight was eating an almonds right off the tree and seeing the almond shaker, which seriously had me considering a career change. Check out a video of it on my instagram! We were then treated to a beautiful picnic lunch. 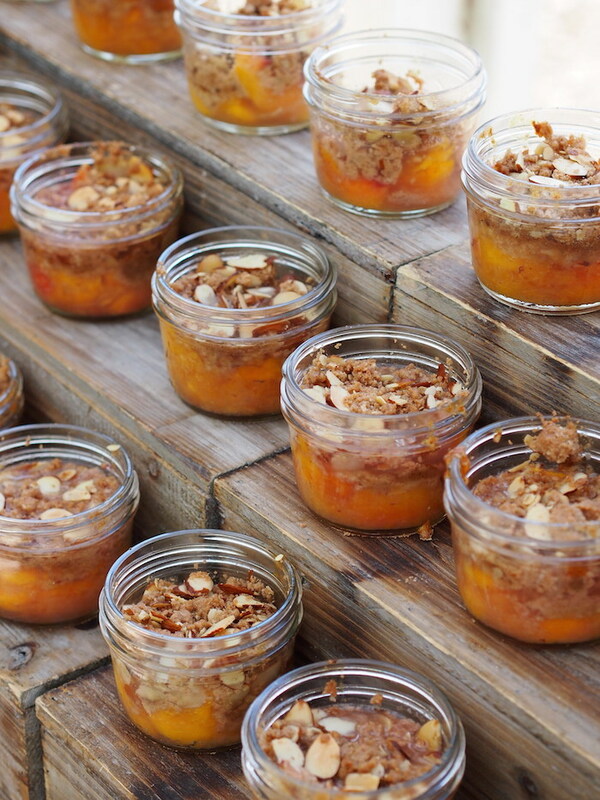 I enjoyed a grilled veggie and goat cheese sandwich, farro salad, cucumber feta salad and for dessert, macaroons and peach and almond cobbler in a mason jar. From there, it was time to say goodbye to all my new and old friends! Since I had a late flight that night, I hung out at the hotel with McKenzie and we caught up on work in our makeshift office, the courtyard of our hotel. Not too shabby! Since my driver was set to pick me up while the rest of the attendees who were staying another day were at dinner, I enjoyed a solo meat at the hotel restaurant on their wisteria covered patio. I started to play on my phone, but then I realized I had the perfect excuse to truly eat mindfully. So, I put the phone away and fully immersed myself in the meal and my beautiful surroundings. Things I love about mindfulness: noticing this gorgeous sky! 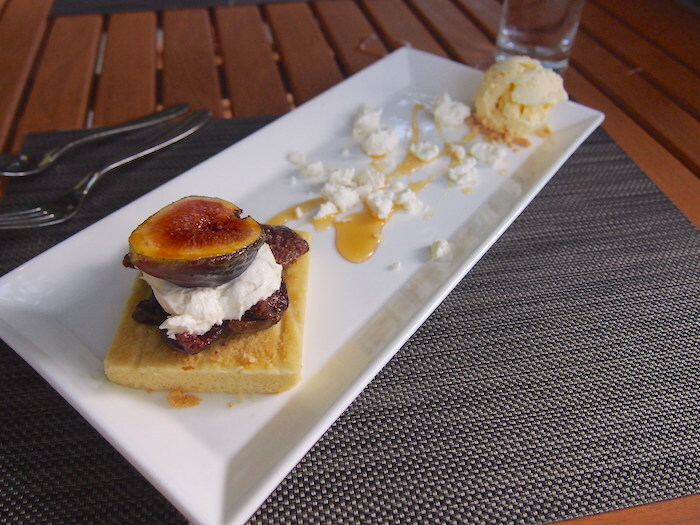 Figs and mascarpone with cake, goat cheese, goat cheese ice cream and honey. Wasn't going to order dessert but this was calling my name! Preheat oven to 400 degrees. Cut each peach in half around the pit then pull apart from the pit. Cut each half in half. Place peach quarters on a baking dish. Mix balsamic vinegar with honey and drizzle over the peaches. Season with salt and pepper. Place in the oven and roast 30 minutes until caramelized and tender. While peaches are roasting, place bacon slices in a cold skillet and turn on medium-high heat. Cook until crispy, flipping halfway. Remove to a paper towel lined plate and set aside. Place greens in a large salad bowl. Halve figs and add to the bowl. Add peaches, crumbled bacon, blue cheese, and almonds. Whisk olive oil, mustard and vinegar in a small bowl. Drizzle over salad and serve.